Vewlix F was the first cabinet in the Vewlix series released by Taito. The cabinet has a 32" widescreen LCD monitor with a resolution of 1360x768 (750p). Traditional 4:3 images can also be viewed, and the screen can also be rotated (no rotate mechanism). The F model is considered to be the Ferrari of Vewlix line-up. Its superior screen allows lag-free gaming and although it came out in 2006 is still considered to have a high end screen even in recent times. A great cabinet for fight games, shooters or any game that benefits from high framerates. 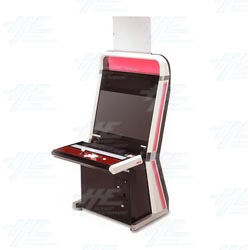 Vewlix F was the first cabinet in the Vewlix series released by Taito. The cabinet has a 32" widescreen LCD monitor with a resolution of 1360x768 (750p). Traditional 4:3 images can also be viewed, and the screen can also be rotated (no rotate mechanism). The F model is considered to be the Ferrari of Vewlix line-up. Its superior screen allows lag-free gaming and although it came out in 2006 is still considered to have a high end screen even in recent times. A great cabinet for fight games, shooters or any game that benefits from high framerates.